Avulsion is serious injury that may encounter during endotracheal intubation and its management often presents a challenge. Replantation of the avulsed tooth can restore esthetic appearance and occlusal function shortly after the injury. The present article describes the management of air-dried maxillary permanent incisors that have been avulsed due to direct laryngoscopy during the induction of general anesthesia for tonsillectomy procedure. 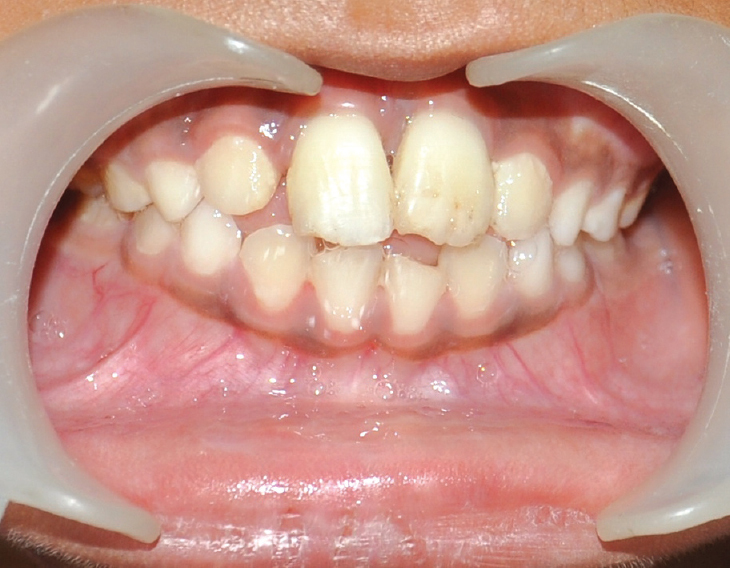 The replanted maxillary central incisors had maintained its function and esthetic for 1 year after replantation. Children in a mixed dentition phase are high-risk group children for traumatic dental injury during laryngoscopy; therefore, Anesthetic Departments should have local protocols to refer patients for dental treatment postoperatively in the event of trauma. Traumatic dental avulsion of permanent anterior teeth is common due to direct laryngoscopy during endotracheal intubation. Teeth that are replanted immediately after the avulsion have a better prognosis that the teeth replanted with increased extra-alveolar dry storage. Due to lack of knowledge many avulsed teeth are brought to the dental clinic in dry storage. Such teeth can be replanted after removing the periodontal tissue. A number of risk factors such as proclaimed teeth, carious or hypoplastic teeth and root resorption increased the risk of avulsion during laryngoscopy. The present paper discusses the management of avulsed permanent maxillary central incisors that have been air dried for 10 days. A 10-year-old boy reported to our department with permanent maxillary central incisors which were avulsed 10 days back due to direct laryngoscopy during the induction of general anesthesia for tonsillectomy procedure. After tonsillectomy procedure, the avulsed teeth were given to patient's parents. They were told that the avulsed teeth are primary and need not to be replanted. The avulsed teeth were dry kept by the parents. After discharge, the patient reported to our department with the avulsed teeth. 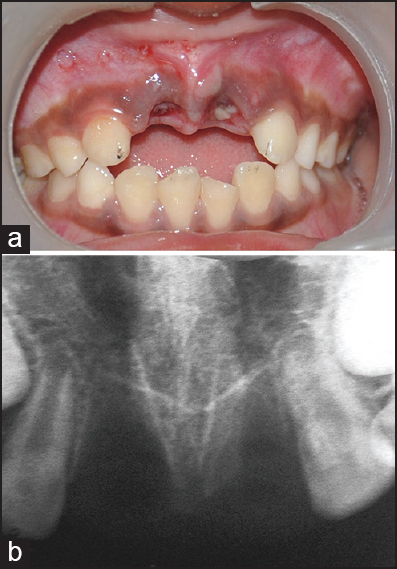 Intraoral examination showed missing permanent maxillary central incisors [Figure 1]a. Intraoral periapical (IOPA) radiograph confirmed the loss of permanent maxillary central incisors [Figure 1]b. The avulsed teeth were diagnosed regarding apex and vitality of the periodontal ligament and pulpal tissue. Both the teeth had closed apex with necrosed periodontal ligament and pulpal. Considering the age and esthetic, re-plantation of the teeth was planned. The root surface of the avulsed teeth was scraped to remove periodontal ligament tissue and then conditioned with citric acid for 5 min. Pulpal tissue was extirpated by gaining excess to the root canal. Root canal was irrigated with normal saline. Calcium hydroxide mixed with normal saline was used as intracanal medicament. Root canal orifice was then sealed with a temporary restoration. The teeth were soaked in 2% stannous fluoride solution for 5 min. Five minutes prior to replantation the socket of the avulsed permanent maxillary central incisors was curettage to remove the blood clot and washed with normal saline. Teeth were replantation into the sockets with finger pressure and splinted using composite resin for 4 weeks [Figure 2]a. After 4 weeks splint was removed. IOPA radiograph after 4 weeks showed no signs of periapical pathology [Figure 2]b. In the subsequent visits calcium hydroxide dressing was removed and root canal obturation was done using gutta-percha points. The patient was recalled after every 6 months. 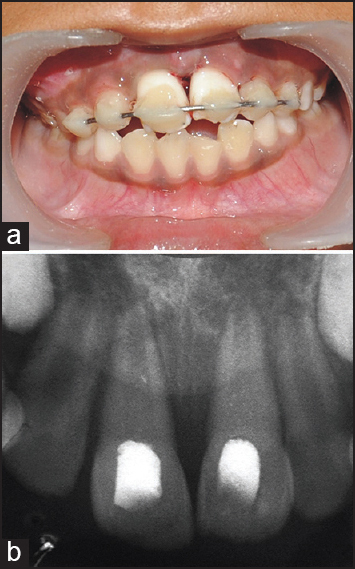 After 1 year, the teeth were healthy, asymptomatic, and showed no clinical signs periapical infection [Figure 3]. The avulsed teeth can be best manage by replanting within 20-30 min after the injury or keeping in an appropriate storage medium until the patient is taken to the dentist for replantation. Immediate replantation or use of storage medium will preserve the viability of periodontal ligament cells and so to optimize healing and minimized root resorption. Although immediate replantation has been shown to have best prognosis, unfortunately this rarely occurs. Cvek et al. demonstrated that 13% of the teeth kept in a dry state for 15 min, 40% of those kept in a dry state for 20-30 min, and 100% of those stored dry for >60 min shows signs of ankylosis. In the present case, the injury occurred 10 days back, and the avulsed teeth were kept dry. Surekha et al. have reported successful replantation of avulsed permanent teeth after dry storage for 1 week. Cho and Cheng  replanted maxillary permanent incisor that has been air dried for 18 h. The replanted incisor maintain esthetic appearance and functionally for 2 years. A recent case report reported replantation of avulsed permanent incisors after dry storage of 1 week. However, he reported pink appearance on the cervical buccal surface of left central incisor because of progressive replacement resorption. These teeth will definitely get ankylosed and undergo replacement resorption within 7 years. Ebeleseder et al. and others also found that replacement resorption of replanted mature teeth was more extensive and faster for children and adolescents than for adults. Even though, the long-term prognosis is uncertain, this treatment technique has provided an advantage for the patient in his adolescent period. Ankylosed natural tooth will act a space maintainer and maintains natural esthetic. Similarly height of alveolar bone is maintained thus making the provision for an aesthetically acceptable permanent restoration at a later age possible. The choice of equipments during surgery can reduce chances for the accident. The flange of the Macintosh blade is responsible for dental injury. Angulated blades, such as the McCoy and the Belscope, have been reported to provide greater tooth-blade distances and better visibility than regular curved or straight blades. Custom mouth guards decrease the force transmission on maxillary teeth during laryngoscope. Perioperative dental injuries are one of the most common adverse effects during endotracheal intubation leading to expensive dental treatment and claims. Understanding and recognizing the multiple risk factors associated with such injuries helps to prevent dental complications, thus avoiding legal suits. Lockhart PB, Feldbau EV, Gabel RA, Connolly SF, Silversin JB. Dental complications during and after tracheal intubation. J Am Dent Assoc 1986;112:480-3. Andersson L, Bodin I, Sörensen S. Progression of root resorption following replantation of human teeth after extended extraoral storage. Endod Dent Traumatol 1989;5:38-47. Ebeleseder KA, Friehs S, Ruda C, Pertl C, Glockner K, Hulla H. A study of replanted permanent teeth in different age groups. Endod Dent Traumatol 1998;14:274-8. Wright RB, Manfield FF. Damage to teeth during the administration of general anaesthesia. Anesth Analg 1974;53: 405-8. Trope M. Clinical management of the avulsed tooth: Present strategies and future directions. Dent Traumatol 2002;18: 1-11. Cobankara FK, Ungor M. Replantation after extended dry storage of avulsed permanent incisors: Report of a case. Dent Traumatol 2007;23:251-6. Surekha P, Supratim T, Mihir P, Pooja T. Reimplantation of avulsed teeth after dry storage for one week. Int J Clin Dent Sci 2011;2:18-22. Cho SY, Cheng AC. Replantation of an avulsed incisor after prolonged dry storage: A case report. J Can Dent Assoc 2002;68:297-300. Watanabe S, Suga A, Asakura N, Takeshima R, Kimura T, Taguchi N, et al. Determination of the distance between the laryngoscope blade and the upper incisors during direct laryngoscopy: Comparisons of a curved, an angulated straight, and two straight blades. Anesth Analg 1994;79:638-41.